"It has been just over two months since Speaker Shurtleff took over the gavel, and it's been nothing but an abject failure for the New Hampshire Democrats "in charge" of the New Hampshire House. From Shurtleff's caucus members endorsing anti-Semitism, his leadership team openly disparaging religion, and the sudden and abrupt resignation of the House Sergeant-at-arms, New Hampshire Democrats are in complete disarray under Speaker Steve Shurtleff." "Yesterday, Democrat Rep Sherry Frost from Dover tweeted out support for Congresswoman Ilhan Omar's anti-Semitic and divisive rhetoric. 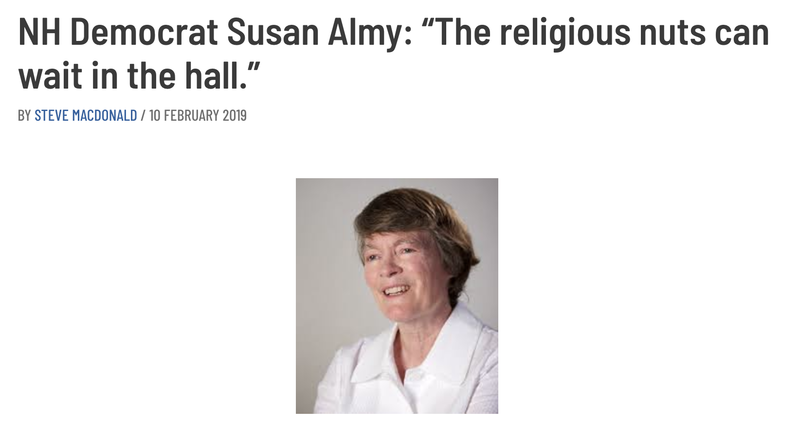 Last week, NH House Ways and Means Chair Susan Almy was heard saying "the religious nuts can wait in the hall", regarding supporters of the Educational Tax Credit scholarship program trying to testify before her committee. Today, we learned that long-serving House Sergeant-at-arms, Walter Sword, abruptly resigned after Speaker Shurtleff sought changes to his expectations and duties." "The New Hampshire House, after just two months of Democrat leadership, is in absolute chaos. The desire of New Hampshire Democrats to push out a dedicated public servant in Walter Sword is reminiscent of when Speaker Shurtleff attempted to force out Secretary of State Bill Gardner, the dedicated protector of our first in the nation primary, by supporting and advocating for Colin Van Ostern, someone who would have used the office to advance his own political agenda and ambitions. The people of New Hampshire won't stand for this, and the members of the New Hampshire House, along with all concerned citizens, should ask the Speaker for more information regarding his handling of the Sergeant's office."